Indulge your passion for herbs, their histories and traditions, and their myriad modern uses in cooking, healing, and natural living with the new Herbarium 2019 Wall Calendar. Its delicate, colorful illustrations will bring beauty and style to any kitchen or office, and each monthly spread includes an interesting anecdote or quote and helpful tips for growing and utilizing the featured herb. 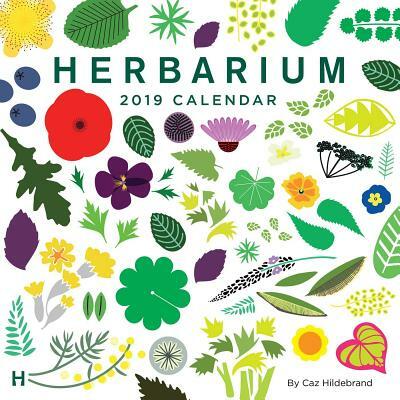 The calendar is based on the book Herbarium, a contemporary approach to the traditional herbal compendium, presented for a new generation of cooks by award-winning designer Caz Hildebrand. Thirteen herbs are featured in the calendar including Lemon Verbena, Primrose, Borage, St. John's Wort, Peppermint, and more. Caz Hildebrand is one of the creative partners at Here Design in London. She is the award-winning designer of best-selling cookbooks by Nigella Lawson, Yotam Ottolenghi, and Sam and Sam Clark of Moro. She co-authored and designed The Geometry of Pasta, an international bestseller. Her latest book, The Grammar of Spice, is also published by Thames & Hudson.